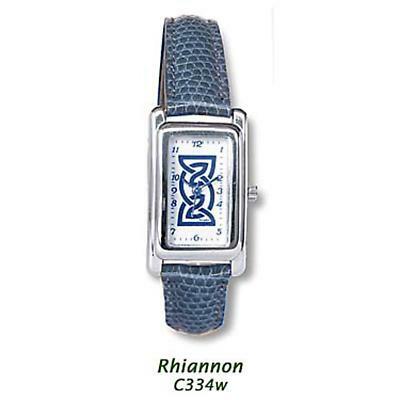 Urien Book of Kells Irish Watch. Gold-plated case, Diam: 2 inches. (66mm) Japanese quartz movement, dustproof construction, stainless steel back, 3 year battery, green lizard leather band. 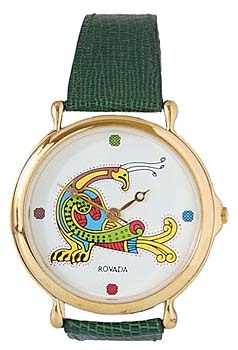 Please allow up to 5 days for watch to dispatch even with our express shipping service.Zoomorphic: Peacock drawing from John's Gospel in the Book of Kells. Urien: Sixth century king of welsh speaking Rheged, in what is now Scotland. Along with his son Owain his resistance to the Angles was famous. Believed to be married to Morgan le Fay. Book of Kells Illuminated gospel book in Latin (preserved in the Trinity College Library, Dublin) that is a masterpiece of the ornate Hiberno-Saxon manuscript art. It was begun in the late 8th century at the Irish monastery on the Scottish island of Iona, and after a Viking raid the book was taken to the monastery of Kells in County Meath, where it was completed in the early 9th century. Made in Dublin, Ireland by Rovada.